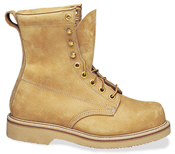 Our Hitchcock extra wide work boots and shoes are made on our own wide work boot lasts in EEE, 5E and 6E widths. Most of our exclusive men’s wide work boots are made in the U.S.A. Many of our styles go up to sizes 15 and we even have a few extra wide steel toe work boots too. All our men's wide work boots and wide work shoes are made on lasts developed especially for this type of footwear. The wide width work boots on our “oblique toe” last follow the shape of your foot for extra comfort. Our Shock Absorbers line of extra wide work boots and oxfords are technically sophisticated with multi-layered soles designed to reduce foot fatigue on the job and have moisture-wicking Dri-Lex linings. You can find size 14 and 15 work boots and also extra wide steel toe boots (safety) in EEEE and 5E widths. 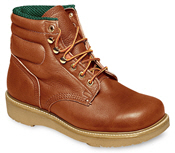 Click the images above to see all the men’s wide work boots we have to offer. Hitchcock has the most complete selection of EEE to 6E wide work boots and the best work boots for wide feet available anywhere!